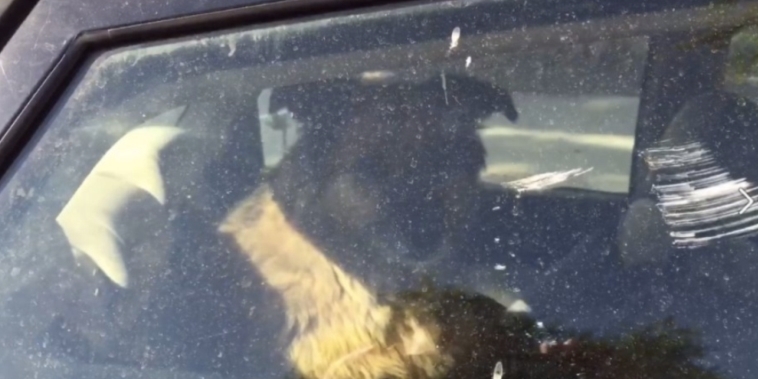 A dog trapped in a hot car was given a much-needed helping hand by the Sacramento Fire Department on Wednesday morning, and the pooch’s rescue was captured on camera. The fire department had been alerted to the dog’s plight by a Good Samaritan who called 911, KCRA.com reports. When crews arrived at the car, which was parked near Sutter’s Fort, they discovered the dog locked alone and panting inside the vehicle. The windows were rolled up and no water had been provided. According to a video uploaded to Facebook by the fire department, the temperature inside the vehicle was upwards of 90 degrees Fahrenheit. Responses to "Video Captures Firefighters Rescuing Dog From Dangerously Hot Car"
Thank you to the person who called 911. I would have broken the window to get the dog out so the Fire Department and Animal Control officer did an amazing job saving the dog. I really hope they don't give that dog back to the criminal that left him there.